You must have an electronic tag to participate in the program. We accept TxTag, TollTag, EZ Tag, K-Tag, Pikepass or BancPass. Click any of these links to be taken to the tag site to learn more and/or get a tag if you don't currently have one. TxTag, TollTag, EZ Tag, K-Tag, Pikepass, BancPass. As mentioned above, an electronic tag is required to participate in our program and registration cannot be completed without it. Program participation is limited to one (1) vehicle per veteran and does not apply to the MoPac Express Lane. Tolls incurred prior to successful registration in our program must be fully resolved to be eligible for participation in the discount program. More information on our program can be found in our frequently asked questions. Please use the form below to register your qualifying vehicle for the Central Texas Regional Mobility Authority’s Qualified Veteran Discount Program. Program enrollment is not automatic. After submitting, please allow 10 business days for a confirmation email to be sent to the registered email address confirming program enrollment. If you don't receive this email after 10 business days, you may email us at veterans@ctrma.org or call us at (512) 450-6317. Below is a chart showing examples of Electronic Tag Numbers for the accepted tags. The unique electronic number you provide must be on your windshield and associated to your vehicle to ensure you aren't billed. Entering your tag number incorrectly may cause your registration to be rejected. Please include prefix and period if applicable. 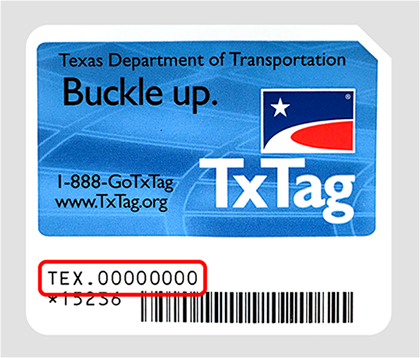 For your convenience, we've included an example of where TxTag's Electronic Tag Number can be found. Location may vary on other tags. Program enrollment is subject to approval. Once eligibility is verified, you will receive an email confirming you have successfully registered your vehicle with the Central Texas Regional Mobility Authority Qualified Veteran Discount Program. If you do not receive this confirmation, please contact us at veterans@ctrma.org or call us at (512) 450-6317. I have read the above CONFIRMATION STATEMENT. The Board Members and staff of the Central Texas Regional Mobility Authority honor and appreciate the service of the men and woman of our military forces, past and present.